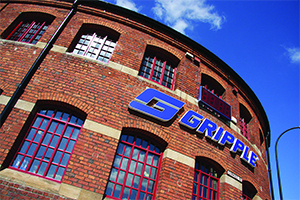 On the 9 March, SELA’s 2014 and 2015 cohorts had the opportunity of attending a visit to the Loadhog and Gripple site in Sheffield – manufacturers of transit packaging and wire tensioners respectively. Both companies are part of GLIDE, an employee owned company that represents all its shareholders. The company is based on an innovative and creative business model not often seen in the world of engineering, and therefore provided a unique insight in a different style of management. Gordon Macrae, the Special Projects Manager at Loadhog and Gripple delivered a talk outlining their ethos and what to expect from the company. A tour around the offices and factory floor allowed all the students to see the scope of the company and their unique design process in practice. Ideas boards, suspended art installations and interactive meeting spaces were all present and integrated into the office space. Although, for many of the students the expansive factory floor provided the greatest interest from a technical engineering perspective. Finally, following encouragement from Gordon many of us suggested methods of improvement throughout the design stages and factory processing, some of which were taken more seriously than others. All members of SELA would like to thank those at Gripple and Loadhog that welcomed us and especially to Gordon Macrae for taking the time to speak with us.